It’s become quite common by now for me to tell people who ask why I am doing a doctorate in biology that I really have no real idea. But in point of actual fact, I do very much know why I am here—or rather, I know at least one very good reason why I am here. When I was 17, a friend and I entered a bookstore together in Kuala Lumpur. We were far from home; for precisely the reason I should perhaps never have been persuaded to study biology in the first place. We were debaters, in a different country for a debate competition, and as debaters, we were used to trucking in rapid-fire exchanges on high-minded ideas on politics, economics, history. Debate in Pakistan, as in many countries, is both culture and cult. It is both a battle of wits and a blood sport. We would constantly litigate if we—teenagers barely on the precipice of self-education—felt that the death penalty was justifiable, if South Sudan should be allowed to secede, if the U.N. should be responsible for paying reparations to Palestine, and so on. But, that day, in Kuala Lumpur, we were entering the bookstore at a new time in our lives. We were both in college and had both come under the influence of the dangerous idea that “science” was fashionable (“science” didn’t really mean science; it meant Isaac Asimov and Richard Dawkins, Carl Sagan and Rachel Carson—the celebrities, the “charismatic megafauna” of science). As luck would have it, a section hewing so closely to our idea of “science,” as science sections always do, was the closest to the entrance. We both left the bookstore that day with copies of Stephen Jay Gould’s Eight Little Piggies (the handsome black cover of the 2007 Vintage Books edition is genuinely hard to resist). I, unfortunately for myself, bought another of Gould’s books as well: Wonderful Life: The Burgess Shale and the Nature of History. I may as well leave my friend behind right now; she escaped science by the skin of her teeth. She was a law and policy major who happened to be a science buff. I, on the other hand, was still uncommitted and was taking predominantly math and physics classes. Today, she’s at Oxford finishing a doctorate in international development and still a science buff, in the best of ways. Eight Little Piggies is bad enough for someone who has yet to decide a major. If you add Wonderful Life into the mix, or Gould’s other masterpiece The Mismeasure of Man, you’re in a good deal of trouble. In the past few years, I’ve returned to Wonderful Life—a bit begrudgingly, I might add—because for some time now I’ve been all in a tizzy about environmental history, what used to be called “natural history” for biologists like Gould and the many who came before him. But the first time I read it, I lost all my mental defenses against biology. I had to give up this idea that what mattered was the grand scheme of things: the charismatic megafauna. In Wonderful Life, before Gould launches full-force into the story of the Burgess Shale—a place in the Canadian Rockies where paleontologists found the best-preserved fossils of animals arising from the Cambrian Explosion—he conducts the most expert feints I have ever read in nonfiction. He tells you that what you are about to read will be a litany of details. He then admits you don’t even need to know the details to understand the story. But immediately after, he pleads of the reader not to skip them, for if they do they won’t see the beauty of the details, of all these fossils, and then he talks about animals we will never see except in drawings, and if you turn the page, you’ve already given in. When a writer as utterly convincing as Gould prostrates himself before you in such a manner, what else can you do? Incidentally, Gould also once wrote that “natural historians tend to avoid tendentious preaching” along philosophical lines, and admitted that he fell prey to the temptation far too often. He wasn’t wrong, but I bet many of his readers read precisely because they were too enthralled by the “tendentious preaching” the way he practiced it. The day I finished Wonderful Life was also the day had to give up on the idea that I could keep just one toe dipped in the world of science while the rest of my feet were soaking in all the things I loved so much more: mostly, history, but also at one point, law. I gave up on the idea of being a polymath, which was what I truly wanted to be. And most painfully now in retrospect, I had taken Gould to mean that to appreciate the details, I had to actually become a scientist, settle in, and prepare myself as if for a duel with gatekeepers who’d insist I hadn’t the mettle for the fight. When I read Wonderful Life now, I’m amazed at this mistake. The only correct reading of Wonderful Life is Gould corralling both scientists and non-scientists by his side, asking them all to see our evolutionary and natural history both as beautiful and humanistic—I say this unequivocally because Gould doesn’t just allude to this; he says it explicitly. And throughout his work, Gould displays a lot of the polymathic tendencies I desperately wanted to develop: He uses iconography, sociology, cultural studies, anthropology, a great deal of history of science, and an excruciating amount of Major League Baseball. After that, there’s really only one thing to do: You major in biology, procure a high enough GPA that top-tier American universities who are loath to take international students in the first place will be persuaded that you will be a star student, you apply to these universities with personal statements that pull passages from Gould’s work to indicate how much of your intellectual thought is shaped exclusively by biology, and if you do it well enough, soon you’re off packing to a university abroad, leaving behind a family proud that you will be the first to get a doctorate. Once there you will meet fellow students who will seem even more ambitious than yourself, you will be startled to find in the laboratory you work in postdoctoral researchers who have been working in the same laboratory for about a decade since they completed their own doctorates, you will join the graduate student union after you realize that your advisor mostly reads and responds to email while you do all the actual labor, but somehow you yourself cannot pay your bills on time, until one day you will realize that every single ambitious colleague with whom you entered graduate school who wanted to be a tenured professor in biology actually swore off academia quite some time ago, and is now unsure about what to do next, and embarrassed about it, because what do you do next when there is nothing you have been trained to do well enough except inspect a single protein or a single gene every day for six years, and then you will finally realize the dark humor in your conundrum, that it wasn’t just this awful, exploitative system of apprenticeship, but also a false reading on your part, a sense of certainty you developed somewhere along the line, and that you do—as a matter of fact—bear some responsibility for this crisis. And what a shame! All this time you could have been trying to become an actor. I believe there is something special, and specially awful, to be an academic apprentice in our times. For the world of academia, it is the kind of ruse that breeds certitude in young people, despite the obvious fact that there is so little in this world to be certain about. The certainty we had when younger has led to so many of us feeling trapped in cages of our own making. We didn’t quite know then that the average length of an apprenticeship in academia—ostensibly to develop the mere ability to study something—has gotten bigger and bigger, just as the prospects become dimmer and dimmer. But we only seem to find out once it’s too late. What makes these times even more special, I think, is the knowledge that we have that we may not see many generations coming forward who can tell us where we went wrong. We feel trapped, we know we are trapped, and we know there is urgency in this crisis, but we appear paralyzed by it. This is merely a belief, but it certainly seems true. It is entirely possible that future generations, if possible, would implore us to rebel. Audition to be in a film. Travel the world to rescue animals. Learn how to make buildings. Visit conflict zones as a medic, journalist, translator, or photographer. Become a lifeguard at a beach. I don’t think it quite escapes any of us that while we don’t have the financial luxury to rescue animals across the world, we also don’t really have the luxury of complaining of it as if it were a tremendous cruelty. That is, after all, the complaint about us millennials, is it not? That we don’t have what it takes for hard work and grit; that we are too ungrateful. If only. Ingratitude would be a relatively easy problem to solve. There’s enough of us to bring each other back down to earth, to ground each other. I assure you—I do know how to count my blessings. “I am lucky,” and because this is a mantra repeated over and over to me by everyone I meet who somehow still believes a Ph.D. in squandered dreams is a thing of beauty, I do acknowledge this, though somehow I seem to be doing so more to convince the beholder that I am not an elitist ingrate, because I am embarrassed that I do not feel as lucky as I should because that must mean I am, really, at the heart of it all: an elitist ingrate. And yet somehow, we’re also in a world where an elitist ingrate with a Ph.D. doesn’t really have all that much to look forward to. The world is both ablaze and deluged—quite literally! There are wildfires that rage across and hurricanes that destroy homes and property and all this time more of us could have been gathering knowledge about how it is that the entire world has suddenly become so endangered. There has been simply no need—again, quite literally!— for this glut of Ph.D.s put out to market (or more appropriately, put out to pasture) except for the metrics in U.S. News rankings and profits to the presidents and top-tier administrators of universities. Knowing that, of course, solves nothing. In fact, it’s all quite depressing and this is just one way in which what we now know to be true becomes so paralyzing. Sure, you can quit. You can always quit. But we’ve been taught quitting is for quitters, and also we hold out hope that the title of “Dr.,” judiciously employed, may one day mean something. I’m not sure any of us is truly convinced by this argument, but it’s the only excuse we have. When we’re sitting in a graduate student union meeting, we all know these things, and there is camaraderie in the misery (though not with that student: the one who sweeps into the meeting 10 minutes late after months abroad and tells us just how inspiring her fieldwork was!). 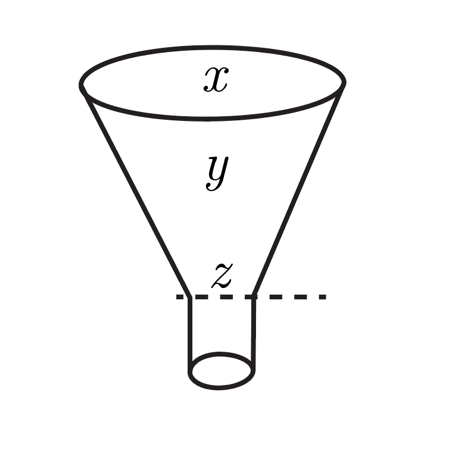 The funnel represents our lives. The possibilities, the choices. 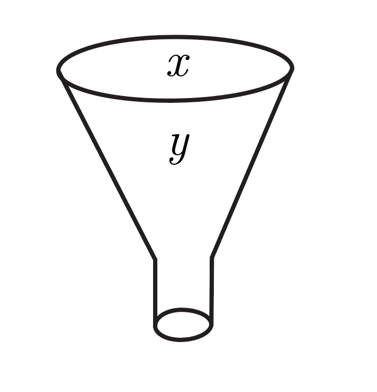 When you’re born, you virtually have an infinity of options, you get to swim at the top of the funnel and check them all out, you don’t think about the future, or not in terms of a tightening noose at least. You think, if anything, that the future will be even more of that, get you more freedom, more choices, because you see your parents pushing your bedtime farther and farther and you think, Well that’s swell, you think it means being an adult will just be super, but then little by little, you get sucked to the bottom. You don’t realize it at first. It starts with the optional classes you elect in high school. More literature or more physics? Should you start learning a third foreign language or get serious about music? And then choices you could’ve made for the future get ruled out without you knowing it, and you sink down to the bottom faster and faster, in a whirlwind of hasty decisions, until you write a PhD on something so specific you are one of twenty-five people who will ever understand or care about it. But they’re the slowest possible way down the drain. They buy you time, they allow you to believe for a while that the amount of specialization of your thesis verges on some kind of universality—and for the best academics, it does, or at least I want to think so—but then in the end it doesn’t matter how brilliant you are, or that you think you can apply that brilliance to other areas of research: academia has already confined you to the one field you picked years before. That’s why Aurore is all depressed. Aurore is reluctant to go there. “Postdoc hell” is a funny phrase because like many things that are very funny, it is very true. I could sit down this very moment and start writing a very long list of the names of people I know personally who graduated with their Ph.D., and because they wanted to continue on in their field—and truly believed they were special enough for that one tenure-track job—entered one lab for a postdoc and remained in that position for anywhere between five to 10 years, mechanically pushing journal articles into submission queues and conducting endless experiments, all the while being expected to teach all the extremely specific skills you have gained to silly undergraduates and graduate students with lofty ambitions. You could be pushing buttons on a computer to teach the 50th person how to use the fancy new microscope the university just bought, knowing full well that it’d probably be obsolete by the time you’re done because soon you’ll get news of yet another, probably in a presentation by another postdoc—but still, somehow, you’re supposed to be excited about it. You can, however, do something else. You can spend those years in one lab, and then hop to another—one with more prestige, more postdocs, less graduate students. But do know this! Your postdoc advisor will tell you, when you email them, that you must come with your own funding. And so, along with all those applications for tenure-track positions, or adjunct positions, you must also annually fill out fellowship and grant applications for years and years until you finally cave, and where are you most likely to end up? In the growing administrative cabal of the corporate university. Maybe you’ll even be happier there, but you will only really be studying one thing: the unhappiness, or delusion, of academics. “Postdoc hell” is no less an abstraction than “graduate school.” It is a place, a 10th circle of hell. I can take you there. I’ve been a writer for long enough now, and I’ve studied history along with biology for long enough now, for people to ask me if I regret taking on so much. I never say yes, because all that keeps me sane. If they know this long complaint of mine, friends will ask if I regret starting my doctorate in biology, and I don’t quite know what to tell them because I know I knew—almost as soon as I had to take my qualifying exam for Ph.D. candidacy—that if it wasn’t for the fact that I wasn’t a citizen, I would have cut my losses. What I don’t tell them is that instead of regret, I’m thinking about something that will most certainly seem ridiculous to them: going back to graduate school, this time for history. Yes, I know, it sounds preposterous. And yes, this time I will have no excuse for optimism. 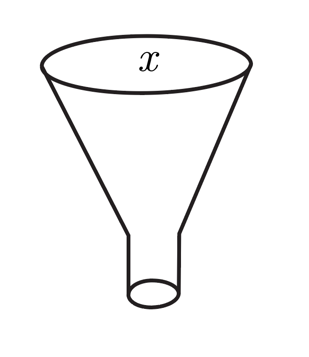 It is probably straight-up masochism that I seem to want to emerge through the neck of one funnel and into another. But just so you know—Isidore’s eldest sister, Berenice, begins another Ph.D. before the book is over. In Chicago no less. I defend my doctoral thesis on November 7. I’ve told my mother to be prepared for the occasion that may arise from knowing I’m hovering at the neck of the funnel, and soon I’m going to have to make a move. Kamil Ahsan is a dual-degree graduate student in Biology and History at the University of Chicago. He is also an independent journalist, essayist, fiction writer, and the Reviews Editor at Barrelhouse. His work has appeared in Dissent, The Rumpus, The American Prospect, Salon, Aeon, Jacobin, and Chicago Review, among others.